Since we're having another hot weekend in Munich after a 2-day break of temperatures below 30°C, I thought I'd give you a Munich insider-tip for cooling down: having gelato at Del Fiore officine alimentari at Gärtnerplatz. 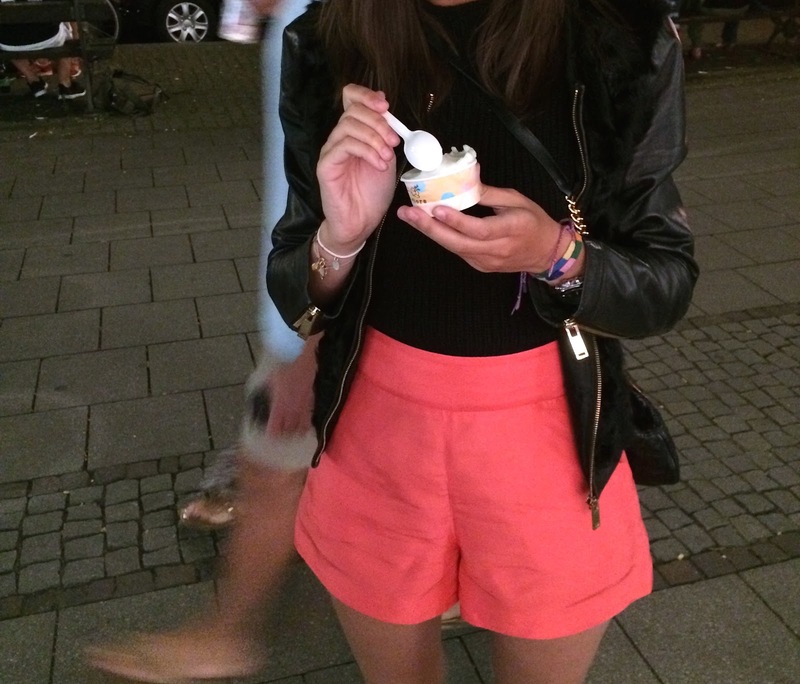 Being so close to Italy, Munich is a city filled with Italian gelato parlours. Even though I'm not the biggest fan of ice cream, I'll gladly make an exception when it's hot and the ice cream is homemade. 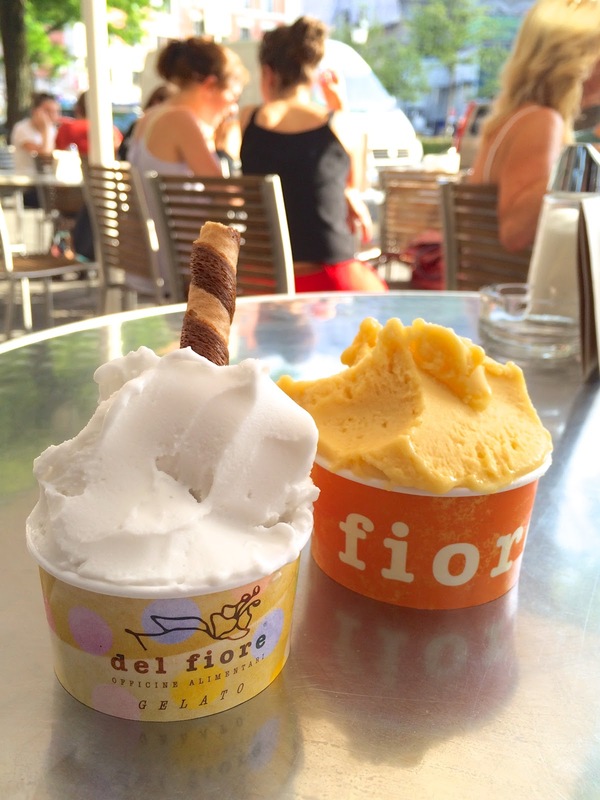 During last week's heatwave, we headed straight to Del Fiore after work to try some of their natural gelato. 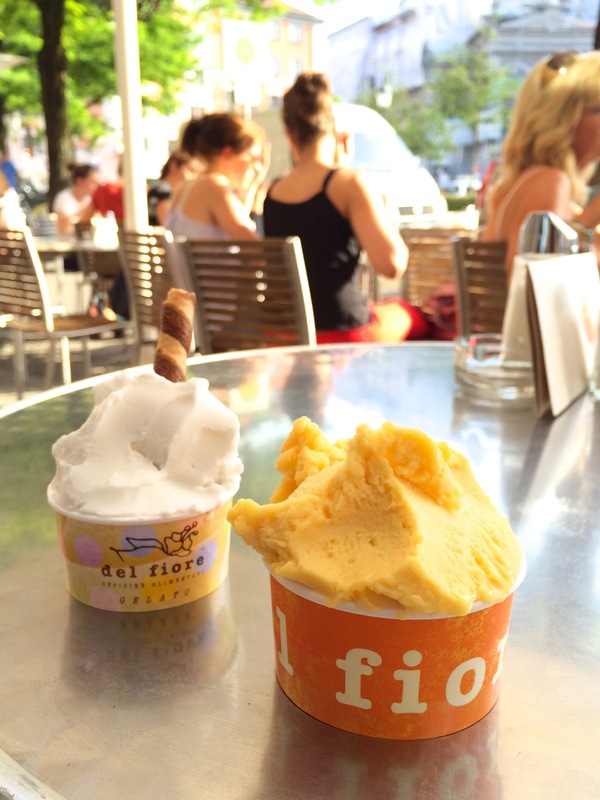 Like most gelato places in Munich, Del Fiore has new flavours every day. There's only a small list of around 10 flavours you can choose from, but even then it's hard to choose. There are different fruit gelato/sorbet flavours such as apricot, strawberry mint, fresh coconut meat, melon but also chocolate, cashew caramel, pistachio, sesame mascarpone, hazelnut, yoghurt & walnut honey... a mix of both classics and more unique flavours. You can ask for a spoonful of gelato to try before making your decision, because it's not an easy feat! My friend went for the fresh coconut meat, which tasted exactly like when you drink coconut juice from a coconut, and scoop out the delicate coconut meat afterwards. This was definitely the winner. I chose mango lemongrass gelato, which had that really natural and real mango flavour, though the lemongrass was a little hard to taste. I was very impressed about how natural the flavours were. Del Fiore uses mostly organic and locally sourced ingredients for their gelato, and no chemical additives, flavour enhancers or food colouring whatsoever. Pure and simple, just how I like it! Yesterday after dinner we wanted something sweet and fresh. 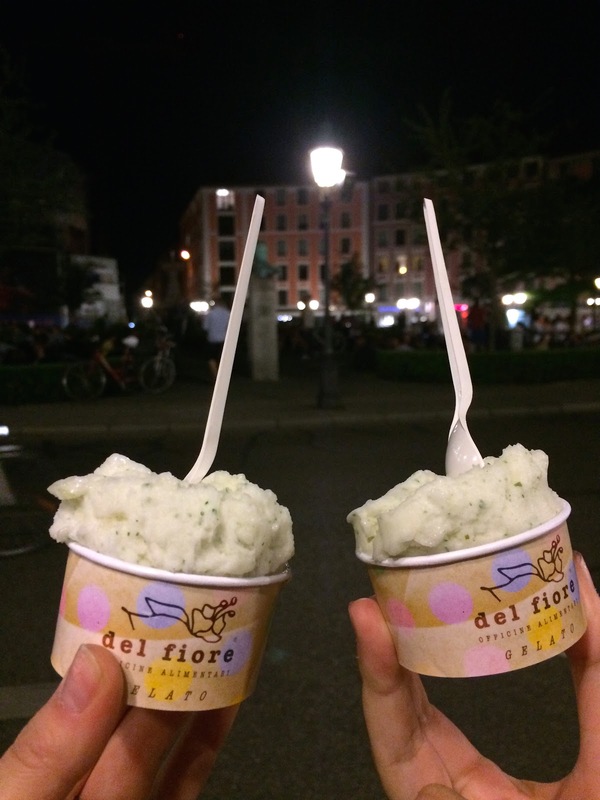 With last week's after-work ice cream still on my mind, we cycled back to Del Fiore to try some more flavours! I sampled the pistachio and strawberry mint flavours, both delicious! But in the end we both opted for the very fresh lemon/citrus and mint sorbet. Again, very natural flavours and a special texture. 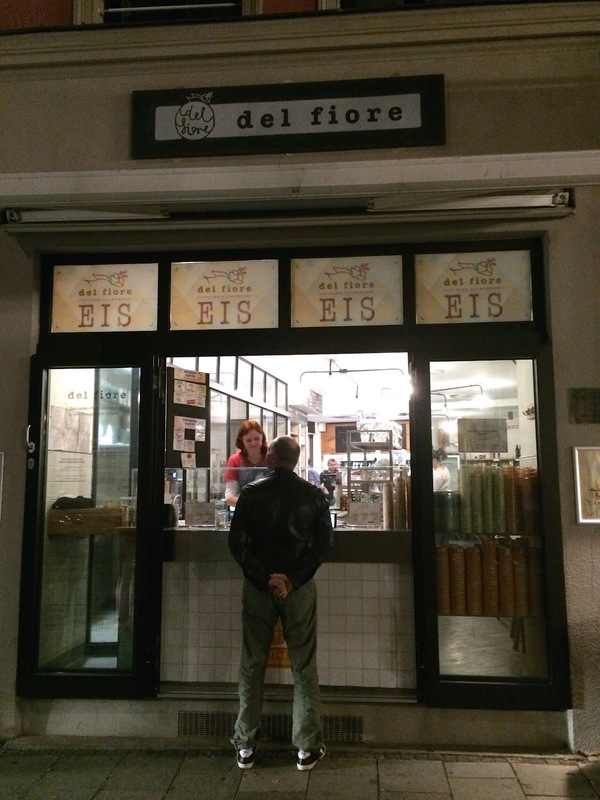 If you're looking for Munich's best gelato, I'm pretty sure that Del Fiore is the one. Natural and real flavours, homemade and unique combinations. For €2 a scoop (sometimes €2.50), it's not the cheapest gelato, but the price/quality is more than reasonable. And being on Gärtnerplatz, you can even sit between the flowers next to the fountain to enjoy your gelato. What's not to love?